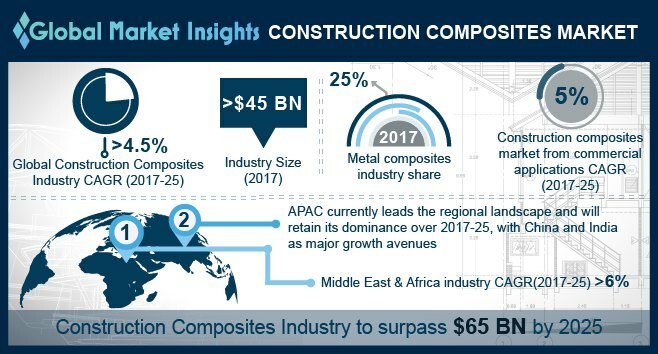 Construction Composites Market size is forecast to exceed USD 65 billion by 2025; according to a new research report by Global Market Insights, Inc. Growing construction activities in the emerging countries due to massive government investments to improve public infrastructure will boost the construction composites market size by 2025. For instance, in India USD 2.4 billion project is currently in progress to build the Navi Mumbai International Airport that started in March 2015 and is expected to be completed till 2019. Similarly, UAE has been making considerable investment in constructing ports which was valued approximately USD 24 billion for the Khalifa Port. Similar construction projects in the emerging nations are probable to make subsequent influence reinforced materials market for construction by 2025. Additionally, the durability, high strength and lightweight product properties will help in driving the construction composite market in the near future. High product prices may become a hurdle in the growth of the construction composite market. Also lack of product awareness shall negatively impact on industry growth. However, rising construction activities and the composites durable and lightweight properties would profoundly augment the construction composite market by 2025. Middle East & Africa construction composites market size is likely to grow at a CAGR of more than 6% by 2025. Government has been making huge investment to improve the overall infrastructure of the region. For instance, government construction spending in the region accounts for 67% with large scale projects, each of which is worth over USD 1 billion which in turn will drive the construction composites market size in the near future. Countries including the UAE, Qatar, Oman and Egypt will power 6% overall growth in the Middle East in 2017 i.e. up from 5.3% last year. Also, increasing number of public private partnership projects is expected to boost investments in the construction sector in the coming years.